Home / News / EXERCISE - Stay consistent! Is exercise a regular routine for you? Often when we get busy and juggle a lot of responsibility exercise is one of the first things we give up because we are tired and time poor. But my question would be, when you exercise how do you feel? My answer is "Better!" Exercise makes us fitter, stronger, more positive, healthier, mentally clearer.. I find being fit just makes everything easier! So if we know we feel better when we exercise, then how can we factor it into each day? "Failing to plan, is planning to fail". Choose the time you plan to exercise, be clear in your mind about what you will do, even get your clothes ready beforehand. It is much easier to stick to a plan when you have prepared for it. You will have more success if the exercise or sport you choose is something you enjoy. There are so many things you can do to strengthen your body and boost your fitness. I personally love cycling, the gym and yoga. Each of these tap into a different part of my personality and keep me really inspired. They give me a combination of indoor and outdoor, social connection and quiet time. I feel balanced with this combination. Choose a couple of forms of activity that you like doing, to give you variety. Repeating the same exercise everyday isn't going to give you optimum results, so mix it up to work different muscle groups and give your heart a cardio workout too. I recently heard Trainer Michelle Bridges and Ultra Marathon runner Turia Pitt speak at a National Achievers Congress. Both of these fit and fabulous women said the same thing. We get results from CONSISTENCY! Consistency beats motivation every time! If we wait till we feel motivated, we're not going to get out there very often. And it's a funny thing, I find when I just get started, the motivation kicks in anyway. Get a schedule going and stick to it. And it's not always about breaking records either. Remember, "Better done than perfect." If we only exercise on the days we feel on top of our game, we're not going to have the consistency we need to get the results. I exercise each morning at 6am. When I wake up at 5.30am on the freezing cold, dark mornings in the Blue Mountains there are many days I feel like staying in the doona. But I say just one word to myself that reminds me of the rule to success.. "Consistency!" The word "consistency" reminds me that it's the things I do regularly that give me the results, and it also takes the pressure off feeling like I've only achieved something if I break my personal records each time. Every workout counts.. it's like putting money in the bank. Work with the body you have today. "Remember to work with the body you have today. Not the body you had, or the body you want to have... but the body you are blessed to have today." These words are so practical and real! They really helped me when I was rehabilitating from my four surgeries after my cycling accident. We all want to be at the end goal, but the truth is it takes work and persistence to get there. I like to think of it as stepping stones across a river. One step at a time, and before you know it you are there! Working with the body you have sets you up for success. You choose what is achievable on the day that challenges you to move forward just a little more each time and before you know it you're there. So don't compare yourself to others who have been through their journey of consistency. If you stay consistent, you'll get there too! What doesn't challenge you doesn't change you! Your mind will give up a hundred times before your body ever will! Our thoughts can sabotage our goals, and exercise is challenging to our body. You'll sweat, your heart rate will rise, you'll feel breathless.. That's what exercise is!! If it was easy, it wouldn't take you to the next level. You'll only improve if you challenge your intensity over time. In addition to consistency of training, support your energy with consistent good sleep and adequate fuel. Skipping meals, waiting until you feel "starving" or choosing food that doesn't nourish you, impacts your energy. You can't run a sports car without fuel. I recover from exercise so much quicker when I eat well and sleep well. And the quicker I recover, the more I can do the next day. Quick recovery is key to progress. Listen to your body for the amount of "rest days" you need each week. Support your muscle recovery with stretching, or using a foam roller after exercise. 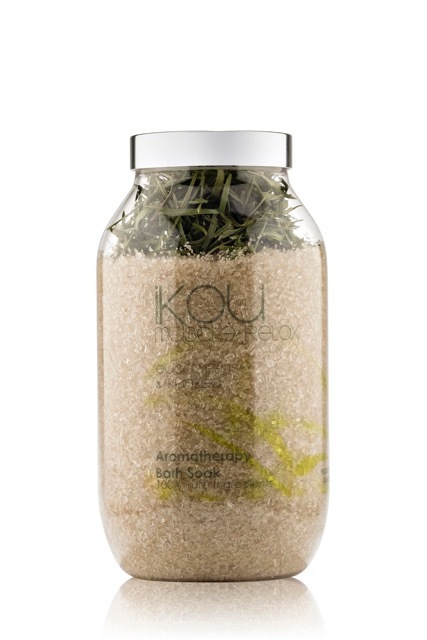 Our iKOU "Muscle Relax" essential oil, magnesium salt bath works a treat for muscle recovery. We have a hot spa on our back deck, so I've been able to test if it's just the hot water that helps, and it's not. I absolutely swear by our "Muscle Relax".. the combination of salts with a trio of warming Eucalyptus, muscle relaxing Basil and drawing Green Clay really warms the belly of the muscle, and the feeling lasts for hours. The next day after a "Muscle Relax Bath Soak" my muscles have always recovered more than if I just had a hot spa. Paul exercises a lot as well, he cycles everyday, including racing once a week and goes to the gym twice a week, and he was commenting the same feeling just yesterday. I hope that inspires you no matter where you are in your fitness, and also gives you some practical tips to stay consistent. I feel so good when I'm fit and strong, and I want you to feel great too! Great blog on motivation Naomi. You have successfully guilted me into going for that walk in the hinterland where I plan to do a nice bushwalk overlooking the ocean skyline, swim in a waterfall and then a bath. The other thing, I’ve removed all the array of different brands and instead have all my beautifully packaged white iKOU goodies displayed with white towels. My bathroom looks so much nicer with everything matchy matchy! Have a great day Miss Amazing!